This idea was pitched to the Kansan staff back in early February and I was chosen to cover it. To be honest, I didn’t know what to expect when I sat down to talk to the AbleHawks, especially when I realized that I knew one the president, E.B.–I had met her in the first month of school at Lewis residence hall and had no idea she had autism. I walked away with more than an hour of interview on my recorder and 5 pages of notes. My editor and I felt that, even though it’s a longer story than they had budged for, every part of this story needed to be included. 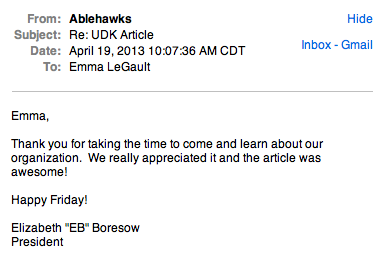 A couple of days after the story ran, I got an email from E.B. It’s the little things like this that break the monotony of writing and make me feel accomplished as a storyteller.